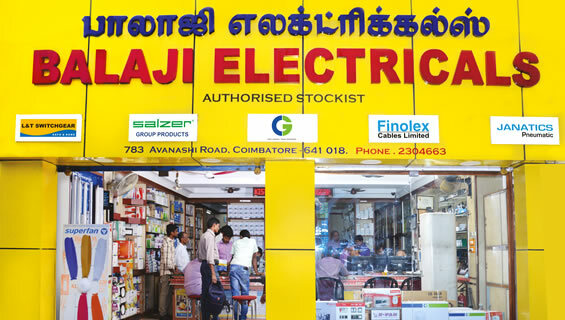 Balaji Electricals is one of the leading electrical dealers and authorized stockists for “L & T” Switch Gear Products, “Janatics” Solenoid Valves, “Salzer” Rotary Switches, “PC” Limit Switches, “Crompton Greaves” Lighting, Fans & Motors and “CONZERV” Power Factor Improvement Panel and all other electrical accessories as well. We take great pleasure in introducing ourselves as a supplier of choice in Coimbatore for a wide range of electrical products. We supply to a spectrum of diverse industries such as Textile Mills, Industries, Paper Mills and Sugar Mills throughout India. Our largest showroom offers a gamut of electrical items from all top brands under a single roof. We also offer Cenvat Credit for L&T, Janatics, Salzer, UG Cables, Vetal and other important products.